While the tax is designed to benefit those counties and municipalities with shale wells the most – hence the name “Impact Fee” – all 67 of Pennsylvania’s counties have actually benefited from it. That $918 million has been used to improve Pennsylvania’s environment, roads and emergency services by providing the needed funding for projects that oftentimes got overlooked prior to Pennsylvania’s shale revolution because of overly stretched budgets. Here’s a look at how the Impact Fee has been distributed since 2011 and what it is being used to accomplish in the Commonwealth. The Impact Fee is designed to provide the most funds to those counties and municipalities where shale development is occurring based on the number of wells drilled in a given year. 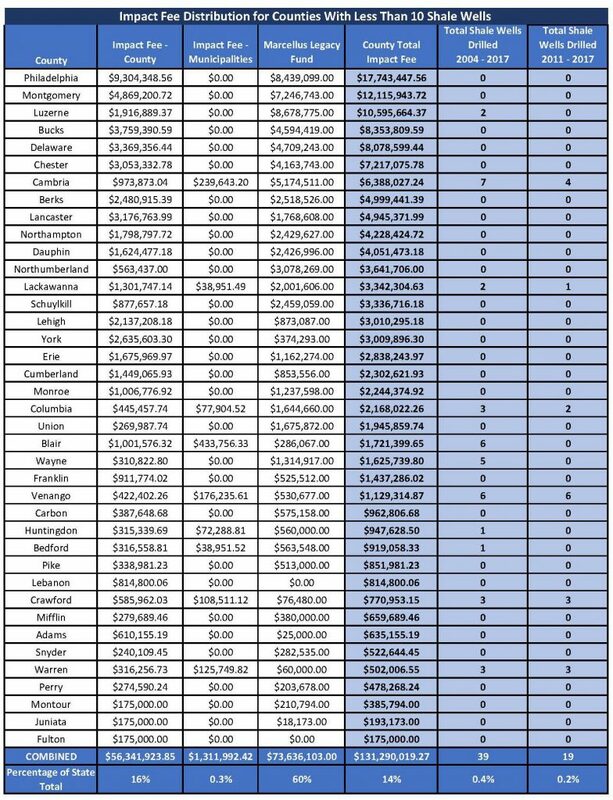 As such, it’s no surprise that a large portion of these payments since 2011 have been distributed to the state’s top-five Marcellus Shale producing counties. These five counties – Bradford, Washington, Susquehanna, Greene and Lycoming – are where 62 percent of the Commonwealth’s shale wells have been drilled since the first Marcellus well was developed in Washington County in 2004. Combined, these counties have received roughly 51 percent – nearly $470 million – of the total Impact Fee funds distributed to counties. The funds for these counties have been used for recreational projects, upgraded public safety and government buildings, collaboratively funding a new police academy, flood mitigation, senior housing, bridge repairs, road repairs, greenways and trails improvements, and a multitude of additional projects. Potter County is one such rural community that has benefited tremendously from the Impact Fee. Potter leads the state in Utica Shale well development and has received nearly $7.5 million in Impact Fee monies since 2011. 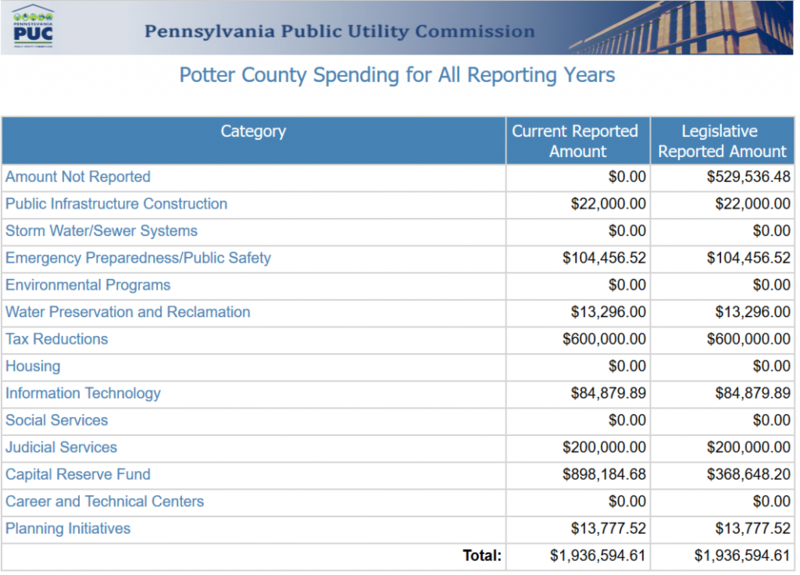 According to the Pa. Public Utility Commission (PUC), Potter County has used the bulk of the money received for its Capital Reserves Fund, to reduce taxes, and for its judicial services and emergency preparedness. 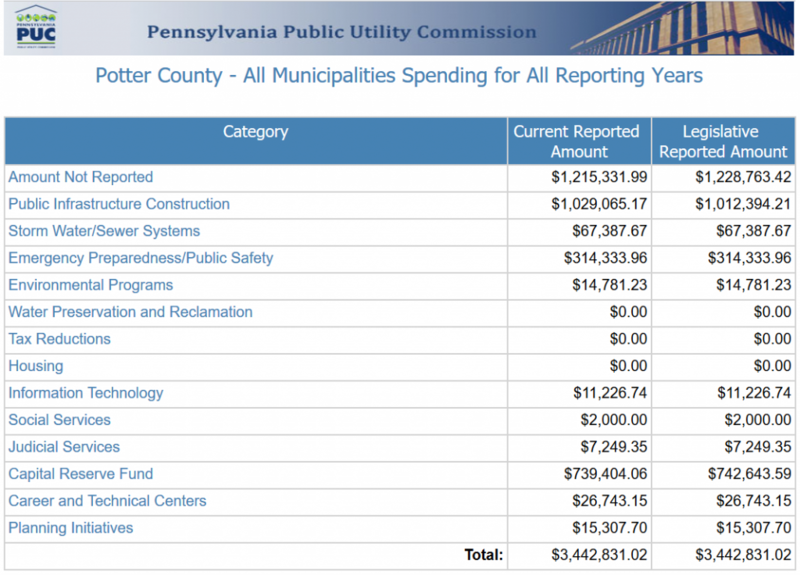 Meanwhile, individual municipalities in the county have spent a large portion of the money on public infrastructure construction and on emergency preparedness. For example, EID learned that Eulalia Township has used its Impact Fee funds to make repairs to its township building that have included drilling a new water well, installing new overhead doors and building a cinder bay. And Sweden Township uses its Impact Fee money to cover police department expenses and its annual contract with the Coudersport Fire Department. While every county in Pennsylvania receives a portion of the Impact Fee’s county distributions, it is through the Marcellus Legacy Fund (MLF) that many of the non-shale counties have benefitted the most. Out of the top five recipients of MLF grants, only Allegheny County has seen somewhat significant shale development. Combined, these counties have had roughly one percent of the state’s shale wells drilled within their borders, yet have collected 35 percent of the MLF grants for a total of more than $43 million. In fact, there are 39 counties that each have had fewer than 10 shale wells drilled within their borders since 2004. The development in these counties represents 0.4 percent and 0.2 percent of the total shale wells drilled in Pennsylvania since 2004 and 2011, respectively. Yet, despite their lack of shale development, these counties have received 60 percent of the MLF grants, or more than $131 million. The MLF grants are used for specific projects within a county. For instance, Allegheny County – the county that has been issued the most MLF grants – received $1.8 million in 2018 for projects related to improving greenways and trails, including a trail and kayak launch development in Springdale and improvements to Renton Park in Plum. The county also received grants for a water and sewage study in Coraopolis and a rehabilitation project for Plum Creek Bank in Oakmont. Chester County, which has no shale wells but has experienced pipeline construction, received $300,000 for playground improvements at Reeves Park in Phoenixville, improvements to East Fallowfield Park, and money for the Land Conservancy of Southeastern Chester County to acquire more land to expand the White Clay Creek Preserve. And Lackawanna County, where one of the largest U.S. natural gas power plants, Lackawanna Energy Center, recently began operations, received money for several projects in 2018, including $80,534 for the construction of a monument honoring roughly 1,000 Scranton veterans at Scranton Veterans Memorial Park. With more than a decade of shale development that has propelled Pennsylvania to become the second highest U.S. producer of natural gas, every year it becomes even more apparent just how important this development is for the Commonwealth. And the state’s Impact Fee is just one example of this.